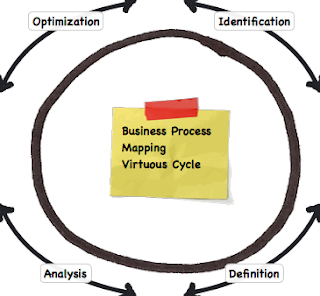 Business process modeling (or mapping) and over time business process management, provide an organization a mechanism to explicitly understand the processes and in turn, activities from which the organization derives value. At MB&A we use the term unit of work to describe these circumscribed behaviors. These include concepts such as line of business, function, process, activity, and task. This grouping concept is based on the level of granularity. For instance, a task is a lower level of granularity than an activity and an activity is lower than a process, or involvement, of a contextual characteristic such as in the case of the age-old debate between function and process. While we start from this basic conceptual understanding of how these units of work live within organizations, we are also focused on ensuring that the client derives the full value possible from the application of our services to develop and mature their business process management activities. We almost always tailor our methods to leverage the types of techniques that will be meaningful to the organization and our methodology to accommodate organizational requirements. This means that if an organization has put extensive time and effort into training its employees on BPMN, IDEF, UML, or some other specific or combination of techniques, we will leverage those in order to get the job done. With many years of experience in the field, our finding is that it is often more valuable to the client to work in the techniques they are comfortable and have been trained in, rather than attempting to train or convert them to a new way looking at business process models. Our team has worked with an incredibly broad array of these techniques and so matching resources and expertise to particular client requirements is fairly straightforward. If there is still a knowledge gap, we are more than happy to engage in short training sessions. This will enable the client to more fully participate in the modeling sessions as well as better utilize the results of those sessions. In the next few paragraphs I will describe our proven approach at a high level, but here again we almost always tailor this approach in order to more precisely meet client requirements. At the outset of the client engagement, we will meet with them to better understand their existing methodologies and the techniques in use to describe the organization. We then develop a baseline understanding of the client’s state of organizational readiness as well to best understand what may work best for the client. We then tailor our high level approach to develop an explicit business process mapping plan tailored to the specific client’s particular requirements. This ensures that we are both on the same page with regard to the methodology and process to be used. It also enables the client to communicate to stakeholders how the project will be executed and facilitates any necessary internal communications. Once this plan is approved all parties should understand the processes, time frames, and value the project is intended to deliver and gauge progress by evaluating the current effort against this projection. At the highest level we approach every business process mapping opportunity by leveraging the following high level steps including identification, definition, analysis and optimization of business processes. In order to facilitate the maturation of a business process management capability within the client organization, we will also attempt to facilitate the adoption of a governance structure. This is in order to place critical business processes under explicit management as well as helping the organization to develop its change management. It also changes the control process to ensure that recommendations that are selected for action by the client can be managed on an ongoing basis, and that the organization is able to assimilate them in a manner that minimizes disruption and maximizes the value of the optimization effort. Identification, or discovery, is a critical component of delivering value to the client quickly. At MB&A one of the things we pride ourselves on is having developed organizational discovery into a rapid, repeatable process that enables our teams to quickly understand and begin delivering value to the client. There is almost never an occasion where we find ourselves to be the first consulting company to ever have walked through an organization’s doors. Due to this, one of the first things we do is collect the previous consulting engagement products for the last three years, and occasionally longer if there is value in it, to the client. Meaning that they have a stable business model and there have been no organizational transformations that significantly reduce the value of the review. Our approach is to first establish the scope of the discovery process. If, for example, we are looking at developing a mechanism for an organization to better manage its business processes as part of a larger organizational transformation effort, we would begin by working with the key client side stakeholders to understand the operational scope of the business process management effort. This includes the business units that had been a part of the effort to this point. This will help us to understand who the various stakeholder communities are that may have been involved in previous consulting engagements or internal efforts so that we can identity and validate their requirements. We can then include them in the discovery processas well as be sensitive to political factors that may have come into play as a result of previous efforts. Too often we find that each consulting company has approached the client with a blank slate method that results in striking similarity in the findings and recommendations produced by various studies and prices mapping efforts. We also do extensive discovery around existing documentation that has been developed as part of internal efforts with a focus on governance bodies (charters), policies, Concept of Operations documentation, Standard Operating Procedures (SOPs), and other key categories of documentation that will help us to understand the organization, key activities, and process by which it delivers value. Throughout this discovery process as the artifact intake is occurring, our team will work to classify and meta-tag the documentation in a repository in order to facilitate the definition, analysis, and optimization components of the work. Often clients find that this activity alone is of exceptional value turning up high value content that was developed as a part of other efforts, but due to staff turnover, organizational changes, or simply the passage of time, the artifact and content was lost. The precise classification and storage of these materials in a repository creates a real organizational asset that can significantly reduce the cost of future organizational transformation efforts. As part of our classification effort the team has used classification frameworks. As an example we used the “APQC Process Classification Framework” at a Fortune 100 client to ensure a common terminology to name, organize, and map their processes. It was also helpful as a tool for explaining the business in terms of horizontal processes rather than vertical functions. Alternatively, we have also developed classifications tailored specifically to an organization’s requirements in order to deliver a means for ensuring maximal value is derived from the repository as it is developed and maturing. The repository technology can be as complex as specific enterprise architecture or document oriented repositories, or as simple as a spreadsheet log and associated file structure. One of the most common situations we find is that Sharepoint will be our initial target repository due to its prevalence in private and public sector office environments. Sharepoint provides an excellent basic workspace from which to perform discovery, enable the team to rapidly assemble and share documents, enable basic meta data capabilities, and provide for the ability to leverage workflows and collaboration tools if appropriate. In one large public sector client, our team has developed a full-fledged collaboration environment from what started as basically a documentation library. The product of a discovery effort into a collaborative workspace that facilitates executive decision making, and provides access to a broad stakeholder community engaged in managing and developing, that clients’ enterprise architecture efforts are essentially needed in transitioning forward. Just as important as the discovery and tagging of these artifacts, is the validation of the documents. This is in combination with the efforts taken to elicit valid artifact components from artifacts that may have other information that is less valid contained within them. Our team works first to rapidly develop the list of artifacts that based on content type could contain valuable information. Then we work with stakeholders to validate that subset of information and catalog it accordingly in the artifact repository. Classify work units into types for management purposes, for example into core- or enabling processes. Which process components are for management, operations or supporting services? Identify the external influence on the process. 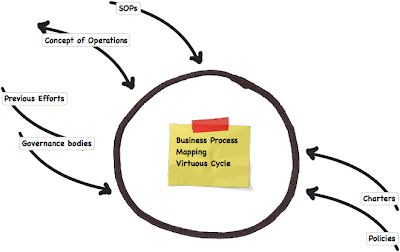 What is flowing into process from outside the organization? Identify the business artifacts being passed from one activity to another. How does one work unit relate to another? Identify all governing statements (laws, policies, standards, guidelines etc.) for each process component. 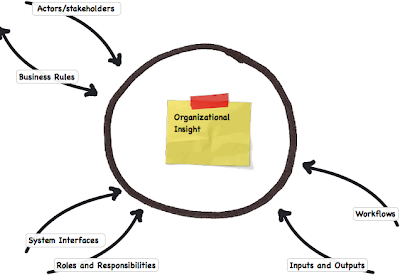 What is driving the behavior of a process component? Identify all enterprise resources (IT components, people and Assets) being utilized to perform the process component. What enterprise resource is involved in the execution of the process? Identify all decision points within the process flow. What decisions are being made in the process? 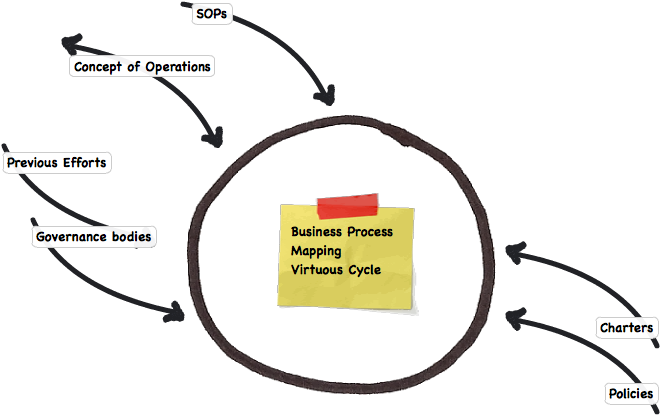 Identify the life-cycle stages of a Business Artifact How does the process change the status of a business artifact? However, in order to derive this business value, it is critical that the business process mapping accurately describes the organization. In order to make this happen, our team will run facilitated sessions to evaluate and refine the initial definitional outputs from the identification and discovery phase. Essentially our team will work from the validated artifacts contained in our document repository to develop initial models in the techniques that have been chosen by the client. Doing this refines the models and ensures they accurately depict the organization at a level of granularity that is relevant to the desired outcome. For example, the level of granularity required to perform the analysis required to support process automation, or perform process optimization analysis, may be different from that required to perform impact analysis with regard to a particular change initiative. However, it is critical to understand from the outset the level of granularity that will be applied to the business process portfolio that is in scope and being developed if the client intends to manage the processes library over the longer term. Our advice is always to maintain process information at the highest level that will allow the client to derive value and facilitate analysis. Deep dives with greater granularity can always be done to address specific issues. As hard as it is to do this work, it should be explicitly disconnected from the “managed” process library at project completion. This ensures that the organization does not include information that cannot be maintained, or worse, present information that is very detailed but incorrect. It is much better to include a pointer to the archived deep dive effort and allow a future team to determine the relevance of the detailed process mapping at the time it is required, rather than attempt to maintain the level of detail that was required to develop a complex automation project or process optimization project. Most organizations simply do not have the resources to maintain that level of detail. The return on investment is normally quite low, and danger of having detailed but incorrect information grows considerably. Unit of work optimization in context: Units of work are described in terms of what flows in and what flows out. This characteristic is quite useful when determining what “value” has been created by the work unit. Secondly, the unit of work’s context, can be further elaborated upon, when the circumstances under which the unit of work is to execute, is described and associated. This is typically referred to as “governance” of a work unit. Finally, the context is completed when all resources being used in the execution of the work unit are identified and associated. Optimizing unit of work flow. The second dimension deals with sequence and decision. Flow normally refers to a collection of work unit items being performed in series or in parallel, with the necessary decision logic dictating flow path. Poor routing and opportunities for parallel processing are often the focal points of opportunities to improve sequencing and flow. Unit of Work and Business Object (Artifact) life cycle optimization. The last dimension takes a slightly different slant. Here the predominant focus is placed on the business object. The work units responsible for moving a business object form one life-cycle stage to another are often critical dimensions that remain unchanged despite organizational changes that sub-optimize the process performance over time. The team will work with the key stakeholders in the optimization activity via a series of workshops, meetings and other collaboration mechanisms to highlight areas where opportunities for improvement may exist and capture relevant details describing these opportunities in order to enable the organization to assess and prioritize them as well to begin to formulate recommendations with regard to possible improvements. The team will then work with key stakeholders to develop a summary findings brief that provides critical insight into the improvement opportunities that have been identified within the analysis and provide recommendations for further study or alternatives analysis depending on the project scope. Once the initial analysis is complete, our team will begin working in concert with the key project stakeholders to begin the actual optimization process focusing on the areas for improvement highlighted in the analysis. This process often includes a detailed analysis of alternatives based on a diverse set of organizational factors including cost, risk, timetables, technologies and strategy. A critical and often overlooked factor is organizational maturity, readiness and motivation to change. No matter how well intentioned or needed a change activity may be, an organization that is unready or unwilling to change can doom even the best architected optimization effort. For these reasons our team will review the in place change management and governance structures that are relevant to the optimization effort, as a component of the optimization implementation analysis. This provides the client with insight into the degree to which an intended optimization may face transformation hurdles based on organizational readiness. The team will also highlight dependencies where applicable in the optimization implementation analysis. This enables stakeholders to understand where key linkages may be within the development of particular capabilities. One particular analysis tool we have used to facilitate this type of analysis is a capabilities matrix, which provides stakeholders with insight into costs, capabilities and dependencies in matrix format. This facilitates decision making with regard to capability development to service a particular optimization implementation. All of this is done to ensure that client understands the potential impact of the optimization to the organization. It also helps appropriately prioritize capability development on behalf of optimization in a manner that meets program management requirements, organizational needs, and transformation objectives.